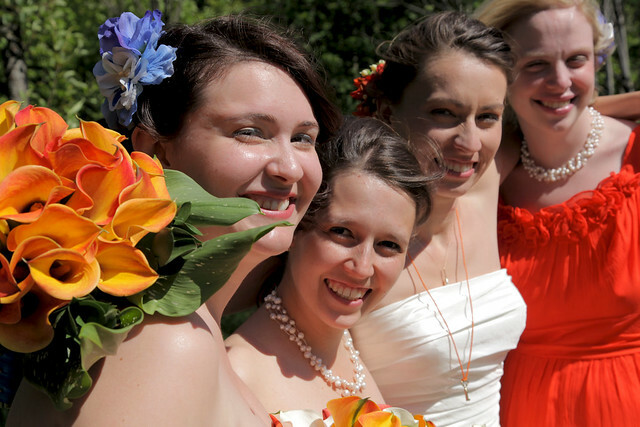 I have been thinking about writing about my bridesmaids for a while, I think it's time! 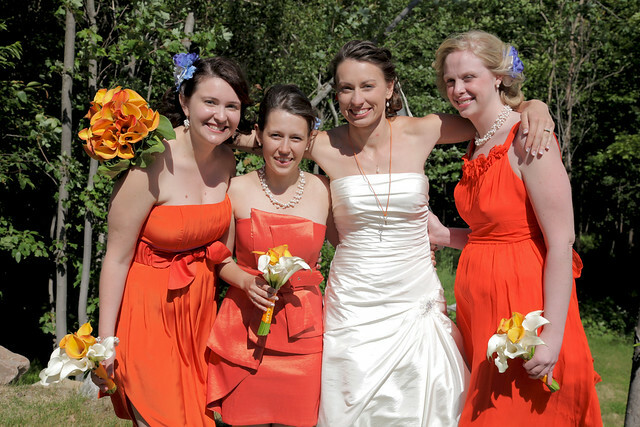 My Maid of honour was my best friend since Freshman year University: Fiona Clark. She is kind of like my female soul mate, we don't need to tell each other things we just know what's going on. She is by far the MOST important friend I have ever had. She means the world to me. Many many people pulled together and helped us during the six months before the wedding but no one was there for me like Fiona. She lived up to being everything one can hope for in a best friend and maid of honour! She came up from New York several times through the 6 months before the wedding to help me try and pick out a wedding dress, print invitations, print fabric, print the napkins, make the decorations, she designed every bit of typeface that one might need and she did a TREMENDOUS job on the wedding programs. She took the pattern and text we gave her and just turned it into yet another BEAUTIFUL part of our amazing day! The programs are tokens people took with them that they will remember the wedding by in years to come and it meant so much to us that she designed them! Fiona organized one amazing and fun bridal shower with a CRAZY bachelorette party... yes we did get picked up with a stretchcar limo in the middle of the woods and got to see some BEAUTIFUL male 'dancers'... ;) ). We had a lot of fun! Fiona was my lifevest through out the preparations, she kept me going the night before the wedding when i just wanted to curl up in ball and sleep at midnight but we were still not finished setting up. And when I still hadn't written out my vows so I can read them off during the ceremony, she painstakingly copied them word for word for me in three languages at 2am, so I could go to sleep and get married a few hours later! Anything I needed she made it happen and I can't thank her enough for it. I wish every bride out there a maid of honour like her. And every woman out there a best friend like her. THANK YOU! I love you, Fi! Anne-Marie and I met in Montreal a couple of years ago and connected and have become close friends since, she now lives in Ottawa, so Scott and I go to visit them (her and Matt) whenever we can, or they come to us. Whenever we hang out it seems FOOD takes center stage. We have crazy elaborate breakfast feasts! So naturally Anne-Marie was in charge of helping me with researching food and coming up with ideas for the buffet, two weeks before the wedding she came to visit me and we baked all the quiche and olive and ham bread for the wedding, we then froze it until the day before the wedding. It's crazy but we did it and it was amazing! THANK YOU ANNE-MARIE! Patricia McCarthy and I met during our studies in Hartford,CT, we lived together for a while and bonded very much over all the allergies we both have! 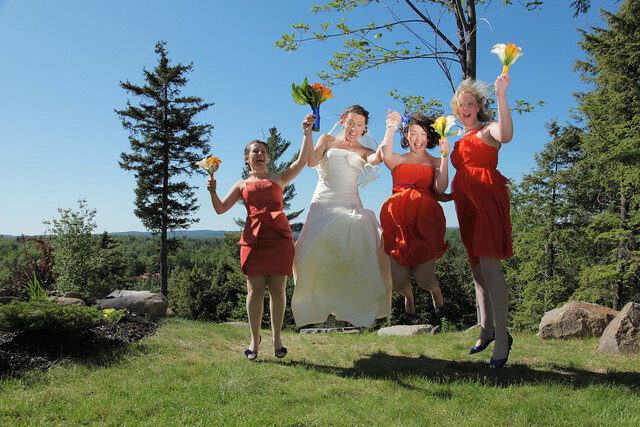 We have stayed close friends since and Trish was a great source of help, information and inspiration during the 6 months before the wedding since she has attended many weddings before. Trish almost didn't make it to the wedding, she was supposed to fly in the Tuesday before but ended up in the ICU at the hospital because of her allergies and I had almost give up hope when i got a text message from her on Friday right before the rehearsal dinner that she was now going through security at the airport and would be there in a few hours! It was quite an adventure and I am SO happy she made it afterall! THANK YOU TRISH! Eva DeAngelis and I have been friends since Highschool in New Jersey and I was so happy when she agreed to be one of my bridesmaids! I haven't seen her in a long time and was thrilled that she would be there for such an important day! Unfortunately it wasn't meant to be, just two weeks before the wedding she was laid off from her job in New Orleans which made it impossible for her to join us, I missed her greatly and wish she could have been there! She did help a lot with the wedding dress research and she made my veil which arrived (despite the postal strike) last minute the night before the wedding. THANK YOU EVA! I hope that she has found a job in the meantime and things look up! The few weeks before the wedding I definitely started to have the sinking feeling that it was bad luck to be my bridesmaid! Veronika Luther was an old friend of mine since 5th grade in Germany and I really wanted her to be my bridesmaid but unfortuntely the trip from Germany was a bit much. Despite the fact that she declined the offer she assisted tons with helping to translate everything into German for the wedding website, the programs and of course the ceremony. THANK YOU VRONI! Suzanne Kennedy and Alice Wong are two friends of mine I would like to mention as well, as I said before there were lots and lots and LOTS of people who helped us tremendously over the last 6 months. But there were a few that put in so much energy and enthusiasm and support that I would like to call them my 'honorary Bridesmaids'. Alice traveled all the way from San Jose, California to attend the wedding, we were friends in Hartford during our University years and have stayed in touch on and off for the past 5 years. She was there for the entire wedding week and she never tired of helping with ANYTHING that needed to be done. If it was doing the dishes or putting up decorations she was always helping. THANK YOU ALICE! Suzanne and I met over the past 2 or 3 years but started hanging out a lot more the last 6 months. Her and her boyfriend Alex arrived on Thursday and from that moment on Suzanne was helping out! When we had to go to the rehearsal and rehearsal dinner on Friday she stayed in the tent and continued decorating relentlessly! THANK YOU SUZANNE!!! Thank you for EVERYONE else who helped with the million details! Our family was very supportive for such a fast last minute destination wedding and did their best to be part of it and help out as much as possible! THANK YOU! As mentioned before tons of friends helped out and Scott and I will never forget it! THANK YOU!